The 56 bronze bells were cast in England and Holland. You can enjoy the music of the carillon on Annenberg Plaza (between the Plummer Building and the Mayo Building) and other nearby locations. 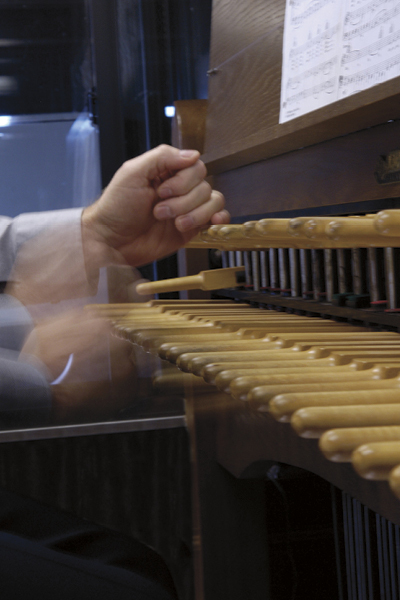 Recitals featuring the Mayo Clinic carillonneur are scheduled throughout the year. Typically 30 minutes long, recitals are also presented on Memorial Day, the Fourth of July and for other special events. In the summer, Mayo Clinic hosts talented guest carillonneurs from around the world. Recitals are open to the public and free of charge. Many carillons play a melody at 15-minute intervals to mark the time of day. At the top of the hour, the bells sound the appropriate number of strikes to mark the hour – for example, 12 strikes at noon. The carillon at Mayo Clinic features two chime formulas, or settings, at different times of the month. These chimes are also known as “quarters” because they play on the quarter-hour. Westminster Quarters - Click to Listen. Iconic melody associated with the Big Ben clock tower at the Palace of Westminster in London, England. In 1928, Dr. William J. Mayo chose this setting for the Plummer Building carillon. Mayo Clinic Chimes - Click to Listen. This melody was composed specifically for Mayo Clinic’s carillon. It combines the work of James Drummond, first carillonneur of Mayo Clinic, with that of Jeffrey Daehn, Mayo’s third carillonneur. The idea for a unique chime setting was proposed by David Daugherty, M.D., Rochester native and graduate of the first class of Mayo Medical School, whose family has a multi-generation history with Mayo Clinic. Dr. William J. Mayo chose these tunes for the Plummer Building carillon. They are now played by an automated system at the same time each day. 6:00 p.m. - “Sicilian Mariners” (also known as “O Sanctissima” and “Lord, Dismiss Us with Thy Blessing”) Click to Listen. 9:00 p.m. - “St. Clement” (also known as “The Day Thou Gavest, Lord, Is Ended”) Click to Listen. “America” (“My Country ‘Tis of Thee”) - Click to Listen. A carillon (“care-uh-lawn”) is a musical instrument that consists of at least 23 bronze, cup-shaped bells. The bells are precisely tuned by paring their interior metal surface. The bells do not swing. Rather, they are rigidly fixed to supporting beams that are housed in a tower. Clappers, pulled by wires, strike the inside surface of the bells to create music. The person who plays the carillon is called a carillonneur (“care-uh-lawn-NUR”). He or she sits at a keyboard console called a clavier (“cla-VEER”) that has a double row of oak keys (known as batons) and a pedal board. The carillonneur presses the batons and pedals to move the clappers inside the bell. The carillon is powered entirely by the force of the performer’s hands and feet. Because the tones of the bell sounds are altered by variations of touch, a skilled performer can produce a wide range of sound patterns. The art of playing the carillon originated more than 500 years ago in the area of Europe that now comprises the Netherlands, Belgium and northern France. Carillon music is best heard about 500 feet downwind from the source – ideally, in an open area away from distracting noise. The sound is clearest during crisp, cold weather. However, carillon music can be enjoyed at any time. At Mayo Clinic, a variety of music is played during each carillon concert to reflect the diversity of our patients, staff and visitors. The carillon is an example of how the performing arts support the healing mission of Mayo Clinic. There are more than 180 carillons in the United States and Canada. Most of them are at colleges and universities and houses of worship. Mayo Clinic is the only medical center in North America to have a carillon. At 56 bells, Mayo Clinic has one of the largest carillons in North America. 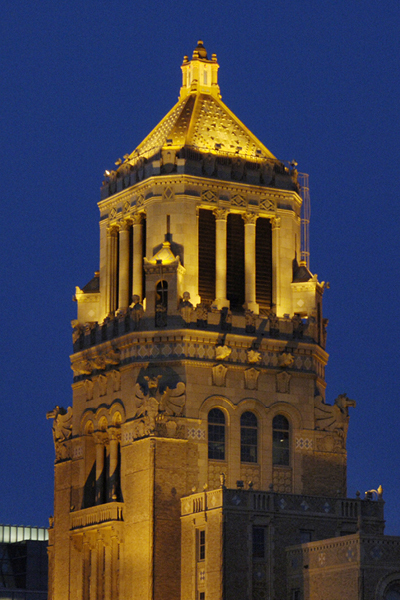 The distinctive Plummer Building tower, which houses the carillon, was not part of the structure’s original plans. Inspired by a love of music and the desire to honor American soldiers following the First World War, the Mayo brothers and other community leaders explored various options for having a carillon in Rochester in the 1920s. While locations such as a city park or local church were considered, construction of the Plummer Building provided an ideal solution. The building’s plans were altered to create a tower with carillon. Since then, the tower has defined the city skyline. The original 23 bells were the gift of Drs. William J. and Charles H. Mayo. They were cast in the foundry of Gillett and Johnston in Croydon, England, and consecrated by the Archbishop of Canterbury before shipment to the United States. 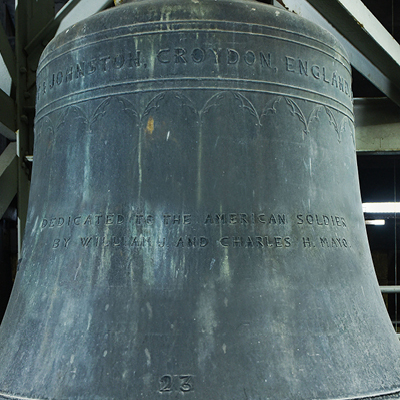 The largest bell is almost six feet tall and weighs 7,840 pounds. The smallest of the original bells weighs 168 pounds. The carillon was dedicated on September 16, 1928, with two concerts performed by Percival Price, the first Dominion Carillonneur of Canada. Thirty-three bells, along with a new clavier, practice console and glass-enclosed performer’s cabin, were added to the Rochester Carillon in 1977. These enhancements were made possible with gifts from Mrs. Frances G. Sheets and Mrs. Isabella Gooding Sanders, descendants of Alphonso Gooding, a Rochester pioneer. The new bells, weighing from 19 to 130 pounds, were cast at the Petit and Fritsen Foundry in Aarle-Rixtel, Holland. Now at 56 bells, the Rochester Carillon covers a 4.5 octave range. 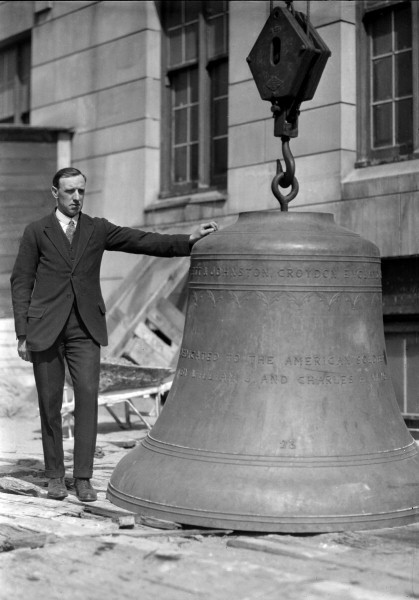 In 2006, the smallest bell from 1928 was found to be cracked and in need of replacement. It was recast from its original mold by the John Taylor & Co. bell foundry of Loughborough, England, and installed in the same location as the original.. Throughout the summer, fall and winter of 2018-2019, the Rochester Carillon underwent a complete renovation. The project included replacing the instrument's entire transmission system, converting an outdated roller bar transmission into a modern, directional-square based action. Each bell was remounted and re-secured to the frame, complete with new return springs to improve playability. New guide wires and turnbuckles connected to the clavier ensure that the performer has the utmost control over the instrument. Perhaps most significantly, the entire bell frame was raised nearly six feet, enabling the sound from the bells to reach audiences more clearly. The extensive renovation work has ensured that the Mayo brothers' musical legacy will continue for another 90 years. Dean Robinson – A Rochester native, he served as carillonneur from 1958 until his death in 2004. He studied music at Oberlin Conservatory in Ohio and MacPhail College of Music in Minneapolis. His career included performing and teaching carillon, organ and piano. Jeffrey Daehn – Originally from Chicago, he studied music at Valparaiso University in Indiana and Union Theological Seminary in New York City. He came to Rochester in 1977 as organist and music minister at Zumbro Lutheran Church, studied carillon with Dean Robinson and other well-known carillonneurs and served as carillonneur of Mayo Clinic from 2004 through 2016. Austin Ferguson - A native of Longview, Texas, he served as carillonneur at the University of Texas at Austin from 2011 to 2015, performing half-hour concerts seven days a week and teaching carillon lessons to graduate and undergraduate students. Mr. Ferguson has been a featured recitalist around the country and is an active member of the Guild of Carillonneurs in North America. He was named the fourth carillonneur of Mayo Clinic in February 2017.